The maggot is the most popular coarse fishing bait used in Britain. Almost all our freshwater species may be taken on it, major competitions have been won on it, and it has also accounted for some record fish. Maggots are small, easy to buy, transport and use. Not so long ago they were cheap, but prices have risen steeply. Maggots now cost about £5/$8 a pint. They are sold this way because pint beer glasses were once used to scoop them up for sale. The maggot is the larva, or grub, of the fly. The maggots of the bluebottle, greenbottle, and common housefly are the ones which are used by the angler. from the greenbottle are called ‘pinkies’. 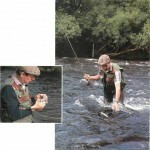 These are also small and used as ‘feeders’, but may be used on the hooks when circumstances require very fine tackle. Commercial fly houses holding the breeding stocks are maintained at constant temperatures of 21.1°C-23.9°C (70-75°F). This enables maggot production to meet the year-round demand. 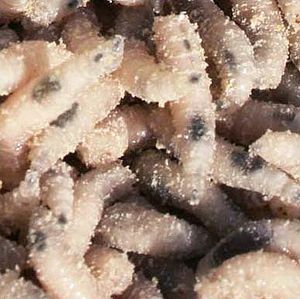 Maggot breeding starts when meat or fish is placed in the fly house so that the breeder flies can lay their eggs. When this is done the meat is said to be ‘blown’. The meat is then removed from the fly house and placed on trays in long sheds. When the maggots hatch they begin to feed and grow. On reaching bait size they are transferred to another tray filled with bran or sawdust. As they wriggle through this they are cleaned and then ready for despatch, usually in large biscuit tins, to tackle shops. There they are kept in fridges to prevent them reaching the pupa (or chrysalis) stage too soon. Maggots are usually sold in saw-dust or bran. To improve their taste remove them from the sawdust or bran and transfer them to a clean bait box containing custard or blancmange powder, flour, or a similar substance. As they crawl through this they become well-coated and tiny specks flake off in the water to add an extra attraction for the fish. Many anglers are now breeding their own maggots, and producing very high quality hookbait. This must be done in garden sheds or somewhere away from the house. (Even professional breeders are often asked by local authorities to move on because of the smell associated with their business.) Quality maggots may be obtained from chicken carcasses. Put these in a container – a large biscuit tin is ideal – and make sure the lid fits perfectly. Make a 2-3in diameter hole in the top and leave the tin outdoors. After a couple of days the chicken flesh will be blown, with clusters of eggs visible. Wrap the blown chicken carcass in old newpaper and replace it in the tin. The eggs will hatch a few days later and the grubs will begin to feed on the nutritious meat. To help the maggots grow fat, add soft brown sugar or even the cream off the top of the milk. Keep the chicken wrapped in the paper, watching at intervals to see how the maggots are growing. When they stop feeding, place the maggots in bran for 24 hours. Next, tip onto a sieve and allow the bran and maggots to separate. Now add clean bran, plus more sugar, which will ensure that they remain soft until needed. The ‘gozzer’ is a very soft, white maggot, the larval form of a type of bluebottle, reared mainly on pigeon carcass, pig’s or sheep’s heart. After five or six days of feeding, these should be given a final bran ‘bath’ and left until required. A very succulent maggot, the ‘gozzer’s’ powers of attraction are highly valued. To increase the attractiveness of maggots to fish, they may be dyed a variety of colours, and indeed can be bought coloured orange, yellow, red or bronze. Tackle dealers supply Chrysiodine R for dyeing them orange or bronze, Auramine O for yellow, and Rhodamine B for red. These dyes may be used in one of two ways. 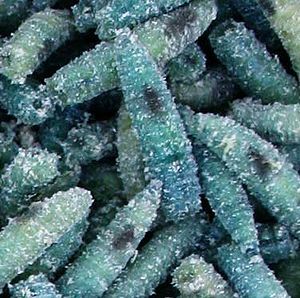 First, the maggots can be coloured by rais-ing them on foodstuffs treated with a small amount of the dye. The second method is best for maggots that have already been cleaned, as they are when bought. For this, sprinkle dye on them and stir well, then leave for one to four hours according to the depth of colour desired. Next, add bran or sawdust on which they will deposit excess dye. Lastly, sieve them to remove the bran, and they are ready for use. The ‘annatto’ is a special colour-fed maggot whose yellow colour comes from the dye used to colour butter. Gozzers and other extra soft maggots produce the best results with this dye. Annatto is bought in roll form and must be cut into slices and mixed into a thin paste with water before use. The best time to introduce annatto is when the maggots are about half-grown. Spread the paste on the meat and replace in the bran. When the maggots stop feeding they are ready for use. To prevent your maggots from turning into chrysalids, or casters, before you want them to, when the weather is warm, place them securely in a plastic box with extra bran and store them in your fridge where they will become cold and still. Make sure the lid of the box is securely closed, but remember that maggots need air, so ensure your bait boxes are ventilated with pinholes. Lastly, if buying maggots from a shop, be sure they are fresh and do not include remnants of last week’s stock. They should be shiny and wriggle vigorously.